If you’re a text message marketing veteran, you know the importance of visually appealing media. Sending out an MMS marketing campaign can sometimes double, even triple your amount of subscriber interaction. Think about how you would react if you were on the receiving end. Which type of message would you respond to – one with a simple text promotion, say “Text WINGS to 31996 for one free order of wings” or one with this text, plus an image of mouthwatering buffalo wings? Which message would incite you to take action? More likely than not, the MMS marketing message. Here are some great MMS campaign ideas to get you started. Take your existing subscriber base, and introduce them to a new product or service by sending out an MMS Marketing Message. If you want to take it to the next level, spark some interaction by including a text message encouraging subscribers to enter to win the product shown in the picture. Send out a picture message of your mouthwatering specials for the night, and offer a reservation promo. For example, “Like what you see? Call 1.800.688.6290 to make reservations for tonight, and show this text to receive this shrimp appetizer FREE with the purchase of 2 entrees. Tonight only, Valid 3/5.” If you send out a picture message that encourages this type of interaction, you’ll see a dramatic increase in that evening’s patronage, as well as an increase in reservations. Encourage subscribers to vote on a new dish or new product. Send out a picture message with two new appetizers you want to feature. 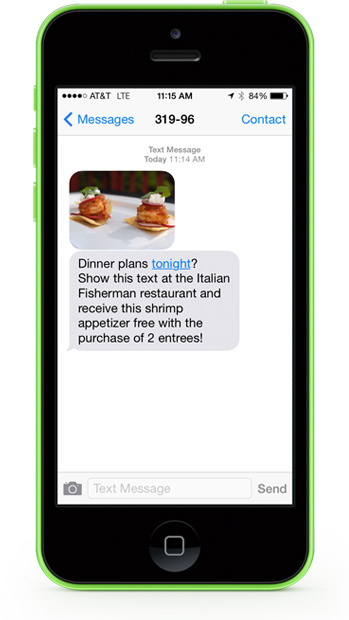 In the text message, ask your subscribers which appetizer they would prefer. Next, set up two textwords (keywords) to represent your appetizers. For example, your first (textword) keyword may be SHRIMP SCAMPI, while your second keyword could be BRUSCHETTA. This represents your two new appetizers. Next, setup a simple confirmation in your textword’s (keyword) auto reply that thanks the subscriber for voting and offers them an exclusive deal for their appetizer of choice. This will allow you to create two new targetted lists based on your customer’s preferences, and will instantly reward those who voted with an offer. Keep in touch with your subscribers on a personal level, and watch brand loyalty and interaction soar. Send subscriber’s images of new renovations, or your staff hard at work. If they signed up for your list, chances are they want to hear from you on a regular basis and stay connected with your brand. They probably frequent your establishment often, and would love to be notified of new business milestones. Ready to send out some awesome MMS marketing messages with Slicktext.com? Give us a call at 1.800.688.6290.